In this blog post, we’ll look at how to migrate to Amazon RDS using Percona XtraBackup. Until recently, there was only one way to migrate your data from an existing MySQL instance into a new RDS MySQL instance: take and restore a logical backup with mysqldump or mydumper. This can be slow and error-prone. When Amazon introduced Amazon Aurora MySQL, you could use Percona XtraBackup to take an online physical backup of your database and restore that into a new Aurora instance. This feature is now available for RDS MySQL as well. Using Percona XtraBackup instead of a logical backup can save a lot of time, especially with a large dataset. Source and destination databases must be MySQL 5.6. Earlier and later major versions are not supported at this time. You can’t restore into an existing RDS instance using this method. The total data size is limited to 6 TB. User accounts, functions, and stored procedures are not imported automatically. If those limitations don’t apply to your use case, read on to learn how to migrate to Amazon RDS using Percona XtraBackup and restoring it into RDS. Note that Amazon prepares the backup, so there’s no need to run xtrabackup --prepare yourself. I chose a db.m4.xlarge instance with 1000 Provisioned IOPS for this test. After I configured all the other options, I clicked “Launch DB Instance” and waited for my backup to decompress, prepare and restore into a new RDS instance. Currently, there is no way to make this connection use SSL. If the source instance is not in the same VPC as the RDS instance, set up a VPN connection between the two networks in order to protect the replication traffic. The time to back up was close: 8 minutes for Percona XtraBackup, and 7.5 minutes for mysqldump. Add the time to copy the backup to S3 (37 seconds), and the two methods are almost identical.The difference comes with restore time. The mysqldump backup took 22.5 minutes to restore, and Amazon took 10 minutes and 50 seconds to create the RDS instance from the backup. Some part of that is the normal overhead of creating an RDS instance, which always takes a few minutes. 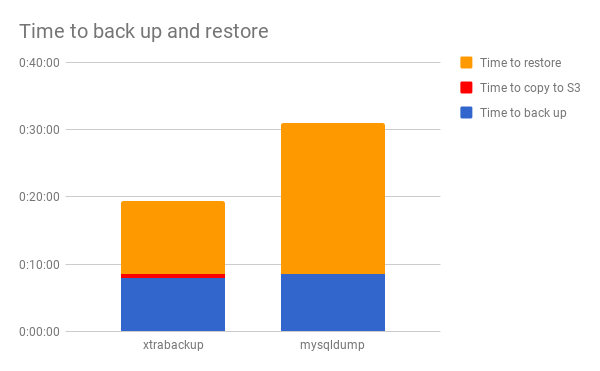 Although my test dataset was small (13.5 GB) compared to most production databases, it was large enough to show a significant difference between physical (Percona XtraBackup) and logical (mysqldump) backups. The XtraBackup method was about 60% faster than mysqldump. If your dataset is larger, you will see even more of a difference. When you migrate to Amazon RDS using a physical backup, it can be much faster than using a logical backup — but it’s not the right option for every use case. If your InnoDB tablespaces have significant fragmentation, or if you’re not currently using innodb_file_per_table, you may want to perform a logical migration to fix those issues. If you normally create RDS instances programmatically, the AWS CLI does not currently support creating an RDS instance from a physical backup. Any corruption in the InnoDB files transfers over to the RDS instance if you use a physical backup, but a logical backup will fail and allow you to fix the corruption before it gets to RDS. For many use cases, however, building an RDS instance from Percona XtraBackup is a convenient way to get your data into RDS MySQL or Aurora relatively quickly. In this one small-scale test, migrating using XtraBackup was 60% faster than using mysqldump. Amazon RDS offers a breadth of database products to choose from, including Aurora and RDS MySQL. If your business is mulling a migration to Amazon RDS, but is undecided about key details, our blog When Should I Use Amazon Aurora and When Should I use RDS MySQL? can provide added insight to help inform your decision. In our blog, Percona Senior MySQL DBA Ananias Tsalouchidis compares Aurora and RDS MySQL and details which environments are best suited for them. Data migration is an important tool to keep up with advancements in technology and industry standards. Let Percona help make the process as seamless as possible. For even more information on Amazon Aurora, check out our webinar. Daniel joined Percona in August of 2015. Previously, he earned a B.S. in Computer Science from the University of Colorado in 2006, and was a DBA there until he joined Percona. In addition to MySQL, Daniel also has experience with Oracle and Microsoft SQL Server, but he much prefers to stay in the MySQL world. Daniel lives near Denver, CO with his wife, three-year-old son, and dog. If you can't reach him, he's probably in the mountains hiking, camping, or trying to get lost. In which stage of the process are you getting that error? If you’re getting it while taking the backup, make sure that xtrabackup is using a MySQL user with appropriate privileges (in particular the SUPER privilege). The credentials can be specified in a defaults file, or with the –user and –password options to xtrabackup.